The bathroom is one of the most frequented sites in a home. It plays host to a variety of necessary fixtures and features that make daily life possible. At ProSource® of Little Rock, you’ll find the bathroom remodeling products—faucets, sinks, showers, tubs, toilets, and vanities--that can transform this practical place into a serene space. The function of a bathroom sink doesn’t have to limit its form. 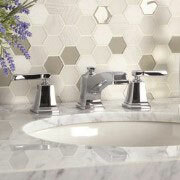 Browse a variety of sinks made from materials such as glass, fireclay, or marble, in a multitude of colors and shapes. 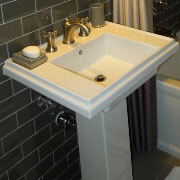 From pedestal to vessel and all types in-between, today’s sinks provide plenty of options. The bathroom sink faucet isn’t the focus of much attention during many bathroom remodels, but it can play a major part in how the decor of the space is brought together. Available in colors from brass to stainless steel, matched with numerous sizes and configurations, there’s a faucet design that’s sure to fit. Showers have evolved from a place to cleanse into a space to escape. Spa-worthy designs make a new shower high on the remodeling wish list. At ProSource, select from an array of bases, doors, and heads to create the perfect shower. Storage in the bathroom can be as stylish as it is practical. 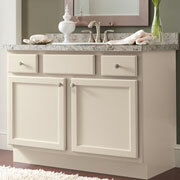 A beautiful new vanity is a great way to tie a bathroom together and provide it some much-needed storage space. 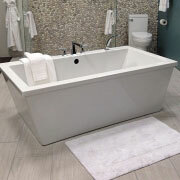 The tub is a destination to relax after a long day. It also helps define the character of a bathroom. Find tubs of all shapes and sizes, made from different materials, at wholesale prices that will only enhance their feelings of relaxation. 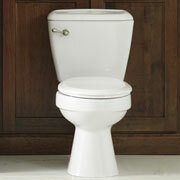 Advances in modern toilet design mean that many of them are more water efficient and better built. That means less time fiddling with the handle and more time enjoying lowered water bills. At ProSource, you’ll find a toilet to match the bathroom’s remodeled design.